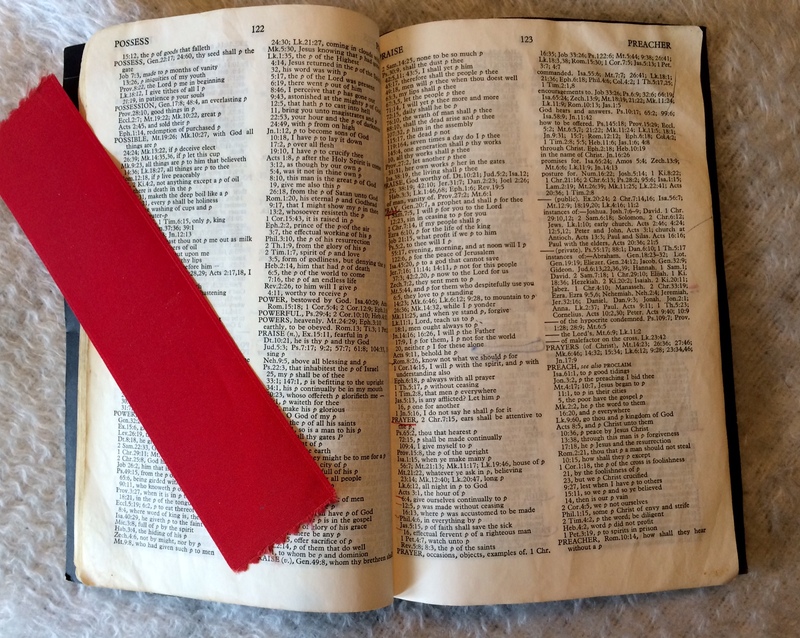 HAVE YOU EVER USED YOUR BIBLE’S CONCORDANCE as a source of Bible Study or Devotional? I don’t mean to find a particular scripture you need, but to choose A WORD, then go down the list of references on that word in your Bible – one-by-one – and consider what God might say to you about your subject… for that day or week. Recently, I’ve been wanting my prayer life to be stronger, meatier. I’ve read a few books on how to do that and heard a few sermons. Then I decided to go to the Book of Books and see how God would instruct me there. Using the concordance on my old KJV (which has many more references to subjects than the ESV version I read), I looked up the word PRAY, and beginning at the first one in the Old Testament, I read the referenced verse, then the surrounding verses in the passage. 4. pray for our country (America specifically) and the repentance and seeking God that needs to happen…beginning with believers. I’m looking forward to what is next on the list – in a few days. Does this sound like something YOU might like to do with prayer or perhaps with other subjects? I’d love to hear your journey.